April 19, 2019: Camp Fire survivors began moving into campsites at Bidwell Canyon Campground this week. The Federal Emergency Management Agency (FEMA) has leased 74 sites at Bidwell Canyon, along with several others in Butte County and surrounding areas, to house Camp Fire survivors. California State Parks and the Department of Water Resources (DWR) began this process with FEMA last December and continue to work together to support the survivors. Our hearts go out to all those affected by the wildfires. Thank you to all of the firefighters, law enforcement and first responders, including California State Parks’ rangers, lifeguards and staff members, for their help. We invite you to explore this webpage to find alternative camping locations and opportunities. February 14, 2019: Lime Saddle Marina and the boat ramp are now open. For those with immediate needs and houseboats, please call (925) 532-5571. From Highway 70, go east on Highway 162 (Oroville Dam Blvd.). Continue on Oroville Dam Blvd., turning right at Olive Hwy. (Highway 162), proceed approximately 6 miles on Olive Highway to Kelly Ridge Road. Turn left and Kelly Ridge Road ends in the Visitor Center parking lot. The area of Lake Oroville closest to the dam and extending into the main body of the lake (approximately 1,000 yards) is closed to boating. The closed area is delineated on the water by a series of buoys which read “Area Closed” and contain the State of California’s uniform marking that restricts access. Notice: Lake Oroville State Recreation Area (SRA) partially reopened February 23rd. Areas surrounding the Thermalito Diversion Pool (Burma Day Use and Lakeland Day Use) and Spillway Launch Ramp remain closed. This includes those portions of the Dan Beebe and Brad Freeman trails leading from the SRA’s Visitor Center to the city of Oroville. The Department of Water Resources (DWR) has been monitoring conditions at Lake Oroville’s main and auxiliary spillways around the clock for signs of erosion that could threaten the integrity of the emergency spillway and allow large, uncontrollable flows to the Feather River. For more information on this incident, please contact the Department of Water Resources at www.water.ca.gov. 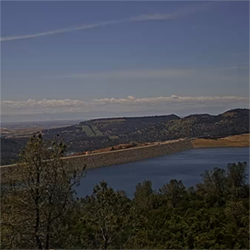 The Lake Oroville Webcams are now available for both the Spillway and the Visitor Center. January 18, 2019: The Visitor Center webcame is currently offline due to damages caused from the recent storms. The webcame will resume some time in February when repairs are made. Lake Oroville was created by Oroville Dam, which the State Department of Water Resources completed in 1967 after 5 years of construction. 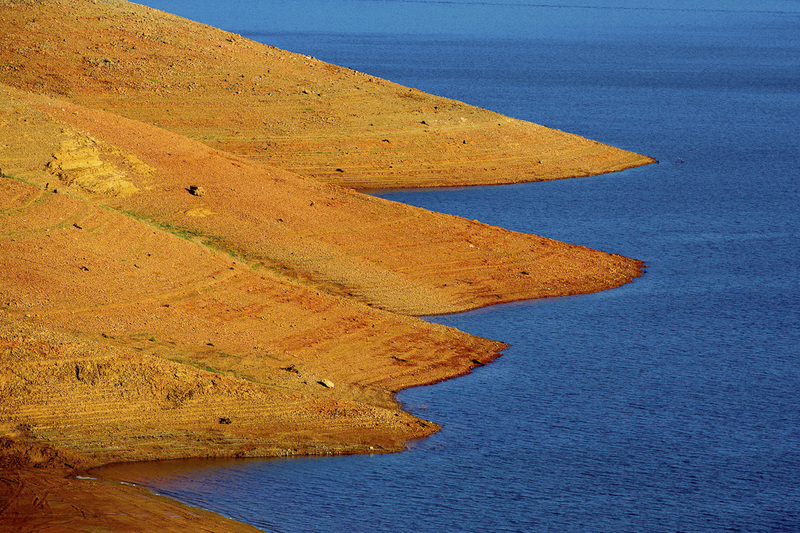 Lake Oroville conserves water for distribution by the State Water Project to homes, farms, and industries in the San Francisco Bay area, the San Joaquin Valley and Southern California. The Oroville facilities of the project also serve to provide flood control and smog free generation of electric power in addition to recreation. When the Lake is at its maximum elevation, it includes some 15,500 surface acres for recreation and 167 miles of shoreline. Recreation areas are spotted around the Lake and boaters can land at any point to explore the surrounding country. The lake offers a wide variety of outdoor activities including camping, picnicking, horseback riding, hiking, sail and power boating, water-skiing, fishing, swimming, boat-in camping, floating campsites and horse camping. The three hundred acre Thermalito Forebay is a day use area. It has planted turf and is regularly watered and mowed. Shade trees from many parts of the world dot the area, including European Sycamore, Olive, Valley Oak, and Zelkova. Ramada's provide shade for picnic sites. Each site contains a stove and one or two picnic tables. Three large group areas are available by reservation through park headquarters. Drinking water is provided by faucet and drinking fountain. The two hundred yard sandy swimming beach has men's and women's dressing rooms and flush toilets. The turf and beach areas of the North Forebay and Loafer Creek are closed to dogs. 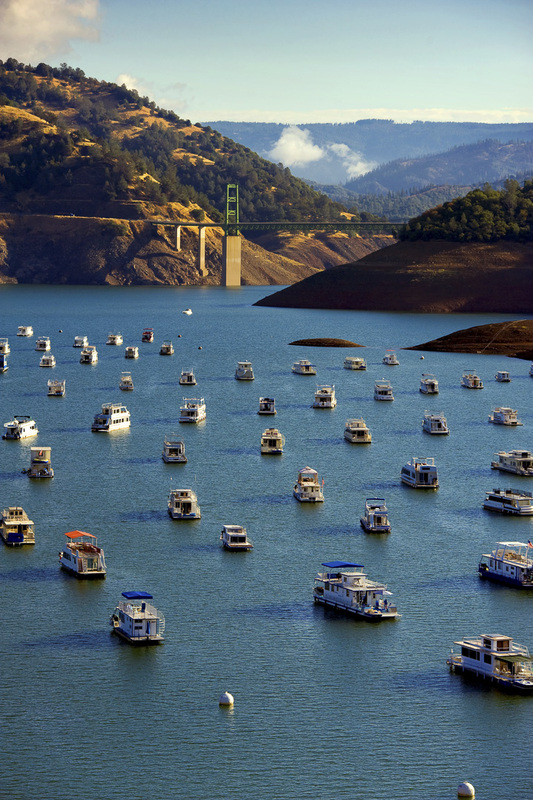 The North Forebay is reserved exclusively for sailboats, canoes, and other non power driven boats. The area has a disabled accessible fishing pier. The North Forebay has frequent trout plants. The North Forebay also has an en-route campground. This campground is designed for one night stays for self contained vehicles only. Thermalito Forebay South has a parking lot, four lane boat launch ramp, picnic tables, a sandy beach, and chemical toilets. There is no shade or drinking water available. Power boating and fishing are the main attractions here. A visitor center complex atop Kelly Ridge overlooks the lake and dam. It features interpretive displays, an audio-visual room where films about the dam and surrounding area are shown throughout each day. The visitor center displays feature a history of the Dam construction and State Water Project as well as a historic view of the Native People that inhabit the Lake Oroville Area. A 47-foot viewing tower allows the visitor the opportunity to have a panoramic view of the dam and beautiful Lake. Lake Oroville Visitor Center has a museum, exhibits, videos and a store. The view from the 47-foot tower, with two high-powered telescopes, is a spectacular panoramic view of the lake, Sierra Nevadas, valley, foothills, and the Sutter Buttes mountain range (smallest in the world). Also see Sutter Buttes: Maidu's Spirit Mountain. The local area around Lake Oroville SRA , includes the Feather River Fish Hatchery, built by the Department of Water Resources to replace lost spawning areas for salmon and steelhead. Displays on the State Water Project and the area’s natural and cultural history are featured at the Visitor’s Center. Lake Oroville volunteers are an important part of the visitor center operation. Looking for an opportunity to contribute your time to an important cause? 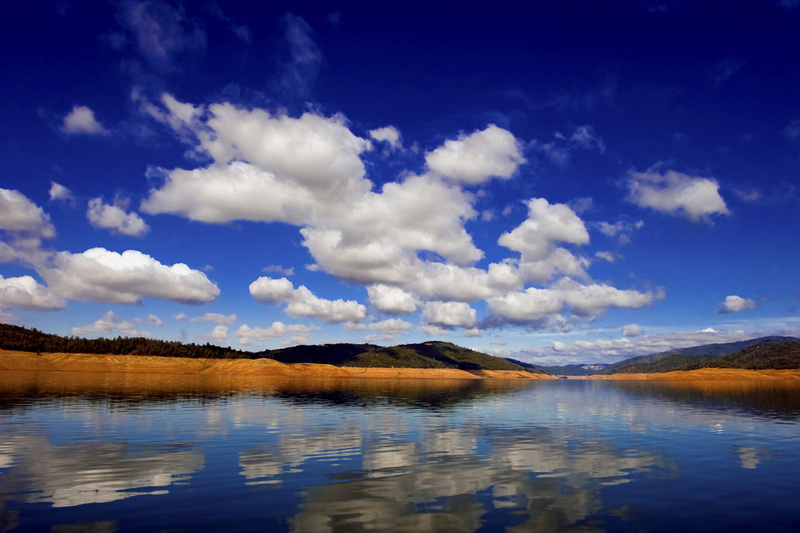 Check out the many volunteer opportunities at Lake Oroville State Recreation Area. For further information call the Visitor Center at (530) 538-2219. 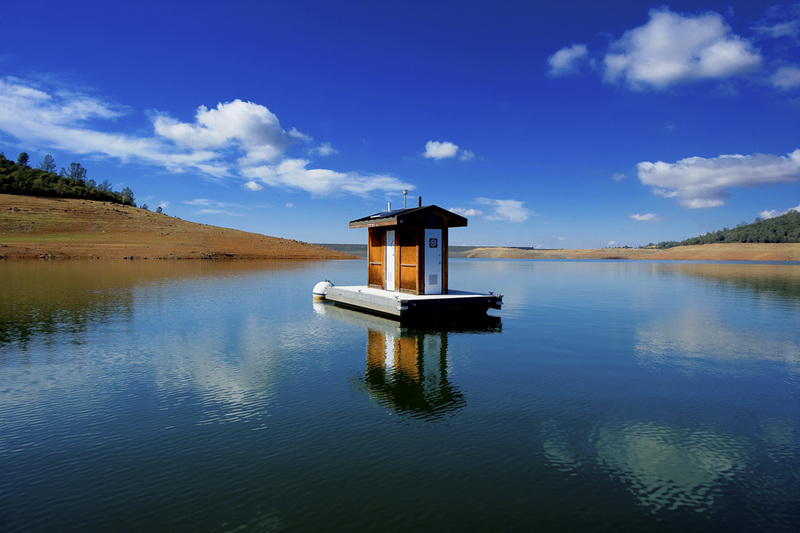 Fishing can only be described as outstanding at Lake Oroville State Recreation Area. Largemouth and Smallmouth Bass aren't the only type of fish you'll find in the lake. Chinook, Catfish, Mackinaw, Sturgeon, and Brown Trout can all be found in great quantities and great qualities. Nineteen pound Mackinaw have been reeled in as well as 3 pound White Crappie. Fishing is permitted all year long but remember, a California sport fishing license is required. Check at the park for "slot limit" regulations for black bass. Spectacular Feather Falls on Fall River is a scenic highlight of the area and well worth a trip up the Middle Fork of the Feather River. Feather Falls is 640 feet high and is especially beautiful during the spring run-off. When the lake is at its maximum elevation, you can boat within a quarter of a mile of the falls. The Feather River Fish Hatchery across the river from the city of Oroville is a 20,000,000 egg capacity salmon and steelhead hatchery built by the Department of Water Resources and operated by the Department of Fish and Game. Underwater windows permit close up viewing of the fish. Within the Lake Oroville area there is a free day use SVRA area know as the Clay pit. 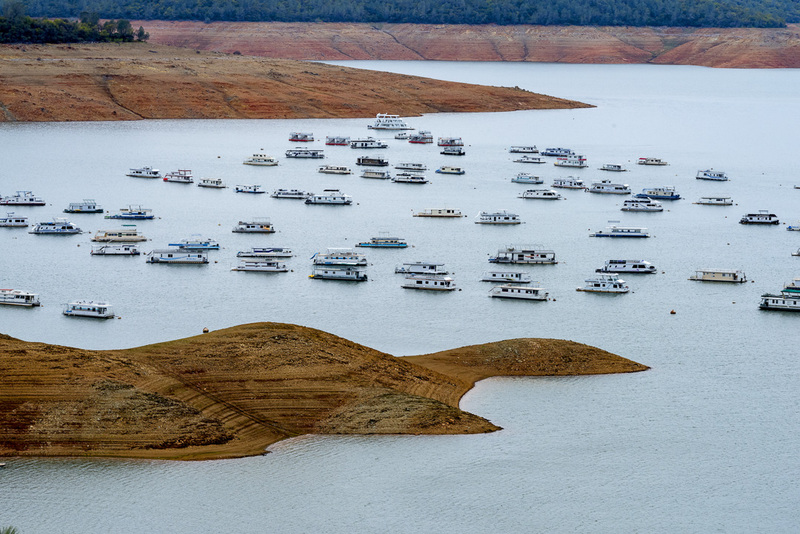 Looking to host a Special Event here at Lake Oroville? Please Email our Special Events Coordinator to help you! Floating campsite check-in is currently located at the Bidwell Marina Kiosk (530) 538-2218. Please verify check-in location prior to arrival. Exact locations of the floating campsites depend upon lake elevation. Information regarding specific locations will be provided upon check-in. Please note that pets are prohibited on floating campsites. 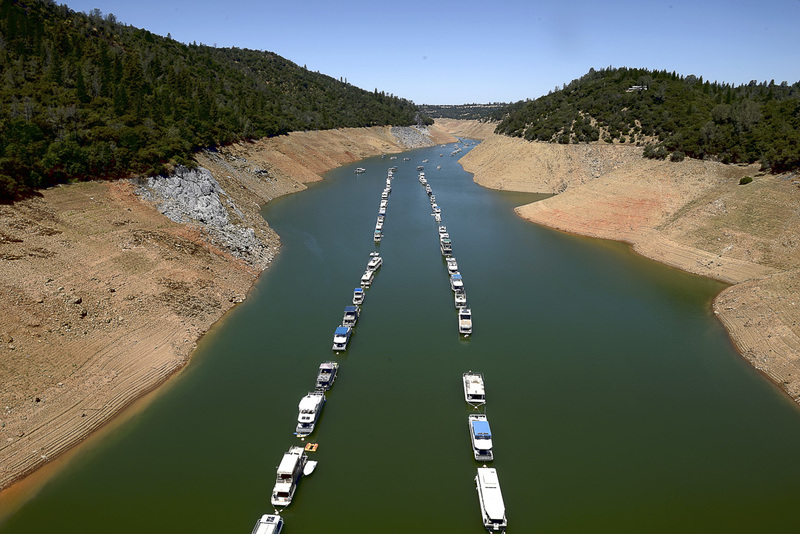 The Lake Oroville area has four very distinct seasons; a Mediterranean-type climate. Winter months are cool to cold, seldom freezing temperatures, and some occasional fog. Temperatures run from mid to high 50s down to the 30s. Springtime is beautiful with a vivid array of wildflowers and very pleasant temperatures, normally in the high 60s to 70s. Summers are warm to extremely warm. The temperatures range from the low 80s up to the low 100s. Fall season usually brings a little humidity, but not much. It cools off at night and the Northern California autumn sunsets are incredible! Bring appropriate clothing to fit the season. 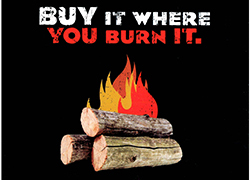 Layered clothing is advised.Campers should bring sweatshirts during the summer months, because it can get somewhat cooler in the evenings and out on the water. From Highway 70, take the Highway 162 exit (Oroville Dam Blvd.) and proceed East. Continue bearing east as Highway 162 evolves into Olive Highway; then after approximately 6 miles, make a left turn onto Kelly Ridge Road. In two miles Kelly Ridge Road ends at the Visitor Center parking lot. BIDWELL CANYON: 68 miles north of Sacramento on Highway 70 to Highway 162; 8 miles east on Highway 162 to Kelly Ridge Rd, left on Kelly Ridge Rd to Arroyo Dr.
LIME SADDLE: North of Sacramento on Highway 70 to Pentz Road; left on Pentz Road, take a right at campground entrance sign, proceed to Kiosk. LOAFER CREEK: 68 miles north of Sacramento on Highway 70 to Highway 162. 9.5 miles east on Highway 162 to Loafer Creek, left into the park. 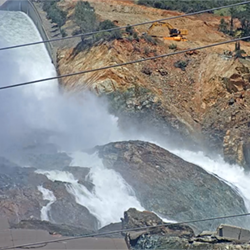 SPILLWAY: 68 miles north of Sacramento on Highway 70 to Highway 162; 6.5 miles east on Highway 162 to Canyon Dr, left on Canyon Dr to Oroville Dam, and cross the dam.